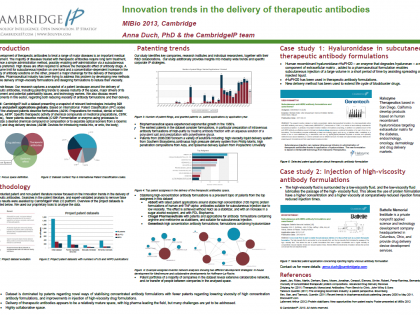 CambridgeIP has extensive experience working in the field of Health and Life Sciences. CambridgeIP has developed unique patent mapping, IP strategy and technology strategy expertise in key Health and Life Sciences areas. We support our clients in their R&D and IP strategy through IP LandscapeÂ® and Freedom to Operate (FTO) analysis as well as non-patent Journal Landscape projects conducted by our team of experts. Our experience in the Health and Life Sciences includes work with major pharmaceutical companies, service providers, academic research institutes & individual inventors. CambridgeIP are experts in the fields of medical technology and pharmaceutical formulations, learn more about how we can help you in this sector by visiting our MedTech and Formulations pages. The extremely diverse field of Health and Life Sciences encompasses a number of rapidly growing industries. For example, in theÂ medical technology space a variety of technological, social and economic factors are driving innovative companies to accelerate product development, whilst in the pharmaceutical formulations space big pharma companies are turning to re-formulation of existing drugs, in response to the impending expiration of their key patents.